On this blog, I have quite a few posts and pages that I update often. I got annoyed with trying to find them under “All pages” or “All posts”, especially over time when they move onto page 2 or 3. So I created the Admin Bookmarks plugin (free to download from WordPress.org). 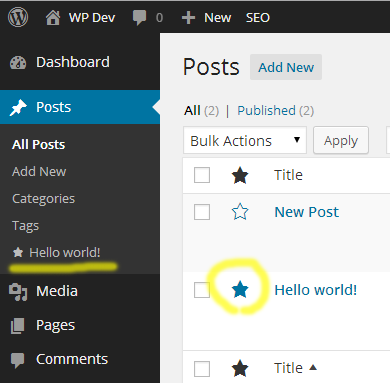 It allows you to “star” (bookmark) pages or posts, which adds a new link directly to the WordPress admin menu. Now you can find and edit those posts in one easy click! 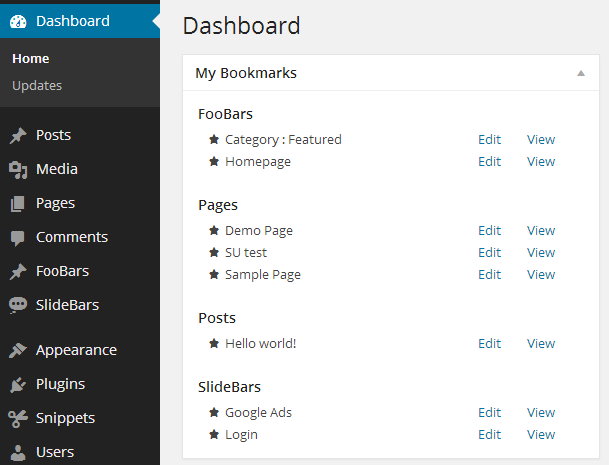 Download the Admin Bookmarks WordPress Plugin. Are you learning Git? Or can you never remember all the available Git commands? Or are you not quite sure what ‘remote’ or ‘rebase’ does? My answer was yes to all of the above. I needed a quick way to see what Git commands were available, and I also wanted to know what parameters they took and how to use them. 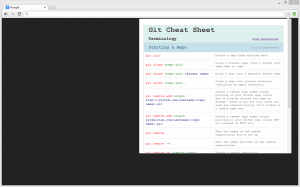 I found the answers to all these questions within the excellent Git Cheat Sheet created by Chris Sevilleja over at Scotch (if you don’t already follow these guys, then do so now!). I really liked their cheat sheet, but I wanted the info to be more accessible. 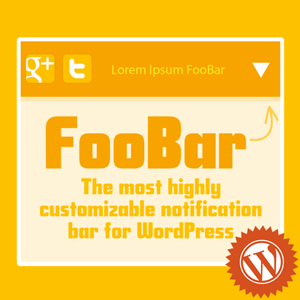 So I figured it would be a cool idea for a Chrome extension. 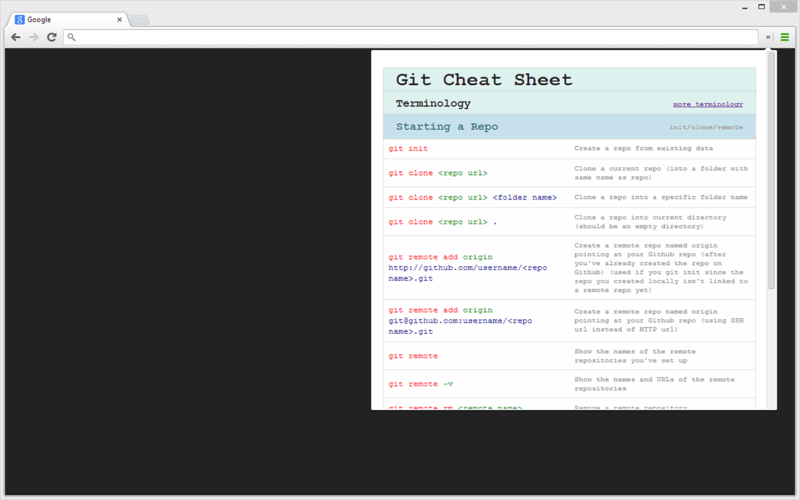 And seeing as I have Chrome open all day, I will have quick access to all the Git commands now too. The extension includes handy Git terminology, commonly used commands and help with the syntax and parameters for each Git Command. Check out the source code for the extension on GitHub. Or install the extension now within Chrome! 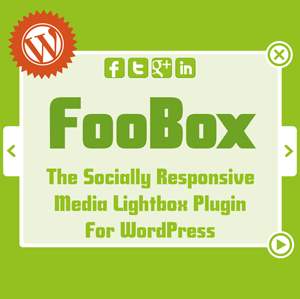 Today we released a new WordPress plugin on FooPlugins that I am very excited about. It was developed by Stephen Welgemoed, who I am very happy to have on team Foo! It’s name is PostFlow. 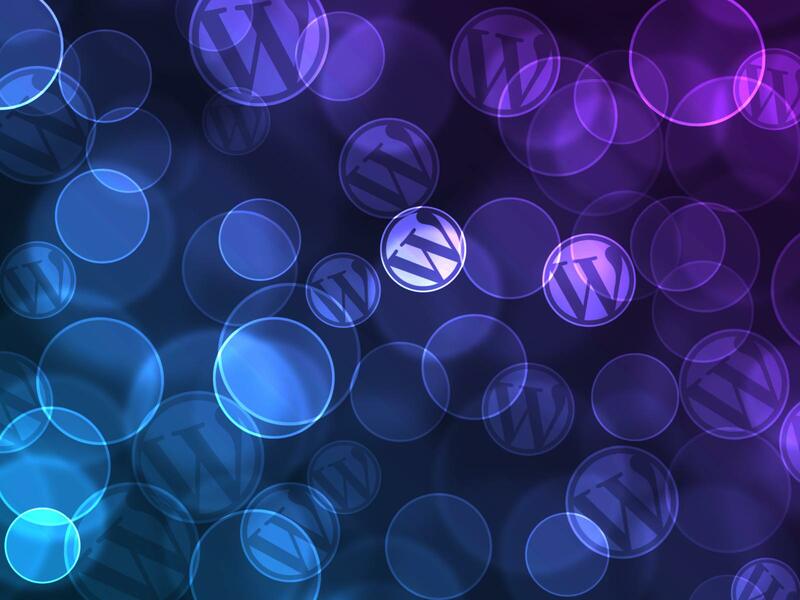 PostFlow allows WordPress administrators to trigger custom workflows when specific conditions are met. And you can fire these “flows” when a post (or custom post type) is set to a specific status of your choosing. Get an email notification when a post is submitted by an editor. Email all editors when a new WooCommerce product is published. Post info to your external CRM software when a new post is published. Email all administrators when a post is trashed. Fire off a custom plugin action when a post is scheduled. The PostFlow plugin has just been released but there are already talks about extension plugins to create more flows. For example, post to Facebook or post a Tweet to Twitter. Then I also thought it would be cool to include other types of events and not just based on when post changes status. How about when someone logs into the site, or when they post a comment. Or when the 404 page is viewed. Or maybe when a Gravity Form is submitted. I will chat to the PostFlow developer and see if these ideas can be added in the future. As you can probably tell, the possibilities are endless, and I think the future of this plugin is bright indeed. Someone even commented on Facebook that this is like “Zapier for WP”, and I really like this idea. I think it could really blossom into a powerful plugin that every WordPress administrator will include in their WordPress plugin “tool-belt”. You can get PostFlow right here and receive 20% off of any license using the coupon code POSTFLOWLAUNCH (only valid for 72 hours). 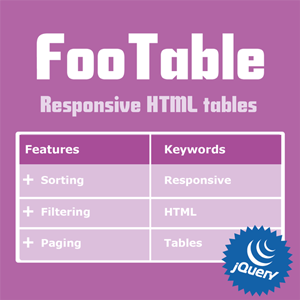 Or check out the blog post with more details about what the plugin can do.